I’ve now got enough data on Alfine Di2 to jump to some conclusions about Di2 battery life in general. Some of what follows is still conjecture, hence the jump, but seems reasonable based on the data I’ve got so far. Update: Click here to cut to the chase; a running report of my real-world battery life since January 2015. I’ve made it through one full discharge cycle and am currently one bar into the second cycle. It took 35 days to completely drain the battery, 25 days until I was down to 1 bar, which seems pretty decent to me. However the amount of time moving during that cycle was a paltry 17 hours. That represents only about 3 days touring at my typical 5 hours per day. Pretty disappointing. Separating Di2 from the Alfine hub itself, performance has been exceptionally good the entire time. Fast, consistent, silent shifts. Though not my ideal style of shifting, the pushbutton shifter is solid and works well with or without gloves. A huge improvement over the crappy SRAM twist shifters I’ve been using and until a Di2 twist shifter comes along, hands down the best shifter I’ve used on a trike. All of the components including the exposed battery, wiring, and junction box have endured without complaint the rain, snow, mud, and indescribable road sludge that coats everything in wintertime. The display looks and works great attached to my side mirror. The installation shown on the right looks pretty clean even though it was quick and temporary. Even the behavior with the battery completely discharged was well designed. The display went to zero bars and shifting stopped working with the gear stuck in its last position. But after a few seconds a single bar appeared and I was able to shift through all 11 gears before shifting died again. I repeated this about 15 times before losing interest. Granted I might not get as many chances in warmer weather but it looks like even when the battery dies you’ll get at least one chance to jam it into a gear that will get you home. Di2 is definitely a keeper if I can make peace with battery life. Considering impact on battery life, the display is the most obvious difference between my setup and Di2 configurations boasting phenomenal battery life. I needed to find out how much that pretty display was draining my battery. 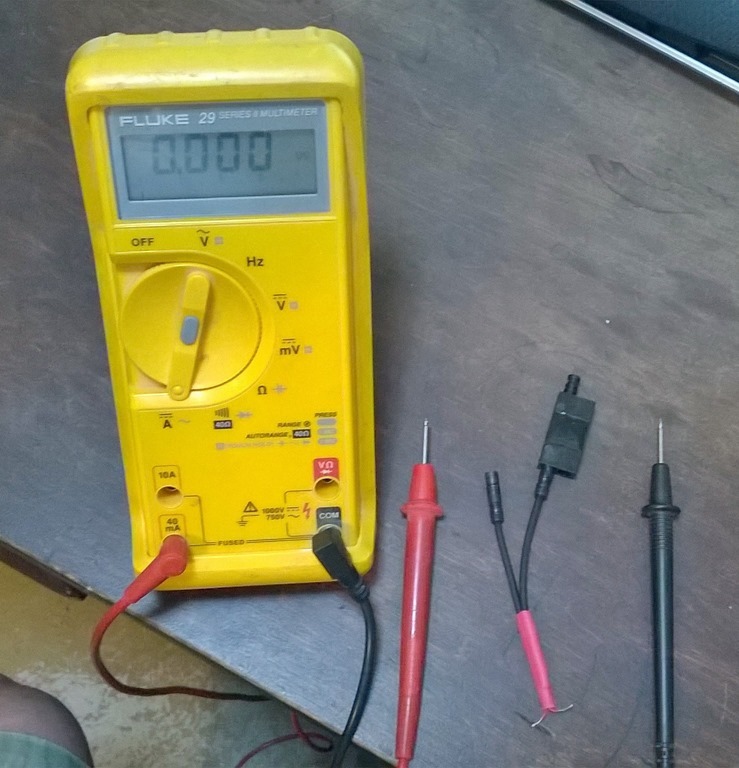 So I screwed up my courage, squinted my eyes, and took a knife to an incredibly expensive 200mm length of E-Tube wire so I could break out one of the leads and insert an ammeter to measure how much current the system is using. Cutting tiny pieces of wire with a sharp razor while squinting isn’t always the best policy, good that my calling wasn’t a surgeon, but I came out of it without any bloodstains and all fingers intact. In the process I learned that an E-Tube wire is nothing more than two very thin, stranded, individually insulated wires, one red and one black, inside the exposed thick black outer sheath. The outer sheath is easy to cut with a knife but seems resistant to abrasion; combined with the stranded conductors it makes a particularly strong and flexible wire. Add to that the thin, waterproof, click-to-lock connectors and you have a high quality cable, designed specifically for the environment in which Di2 is used, that probably justifies its high price. You could use any 2-conductor cable for Di2 but I’m certain nothing else would work as well. Now for a little math. I chose not to post WARNING: Math Ahead at the top of the page for fear that readers might just click away to the latest cat video. Consider yourself warned. A few things become immediately obvious with these measurements. One, in their “off” states, the display and SM-EW90-A cockpit junction box (shown right) are essentially identical. So from the perspective of battery life, the display is the only difference between the two. Two, the current draw while off is small enough relative to the other loads that it can be ignored. With these numbers the system could sit for over three years before the battery is discharged. I’m sure there are other factors that will kill the battery long before that, but you get the idea. Three, the display is drawing a relatively large amount of current. If the system sat idle but with the display on, the 5mA of continuous load would drain the 500 mAH Di2 battery in 100 hours. I’m currently running the display with the default 300 second timeout which means that it is on constantly whenever my trike is moving. In this configuration, 100 hours becomes the absolute maximum moving time I could get, assuming a full 500 mAH of capacity, perfectly efficient discharge, and shifting only enough to keep the display on, once every 300 seconds. So reality will be far less than 100 hours. Take the display out of the equation by either turning it off or using the cockpit junction box instead, and the run time is limited only by Ishift. I don’t have a measurement of Ishift and it is directly proportional to the number of shifts made (averaged over time), but it’s safe to say that battery life will be significantly better with that display turned off as much as possible. Unfortunately the smallest display time the E-Tube software lets you set is 5 seconds, so I can’t completely turn off the display. I’m sure from Shimano’s perspective this makes complete sense—if a customer doesn’t want the display they should just use the cockpit junction box instead. But in my humble opinion, Shimano needs to broaden their collective mind a bit. 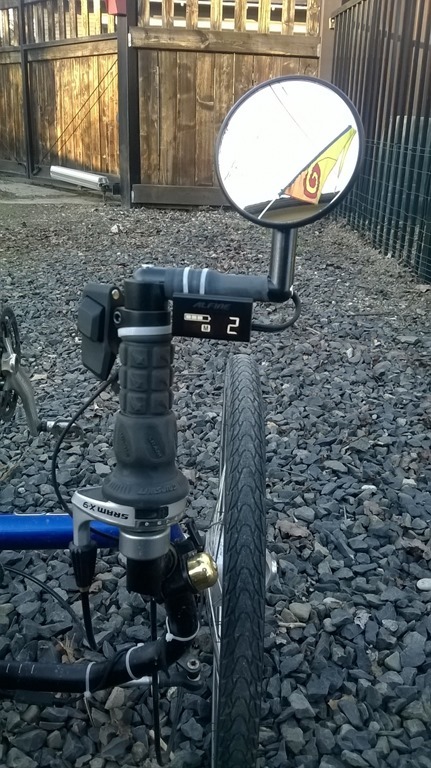 I use my trike in two very different modes: Daily commuting and recreational riding where a display is useful and battery life is not an issue, and touring where a display is optional and battery life is everything. In either mode the display unit is mechanically better than the cockpit junction box, so I’d prefer to use it even if the display is blank. It’s better because it doesn’t have the third, unused port and it allows a cleaner install on my handlebar. I’m sure one of the arguments for a non-zero minimum display time is that the display is the only way of learning the battery’s state of charge. Fair enough, that is especially critical information on tour. But I don’t need 5 seconds to read the battery gauge. A half second would do just fine and I’d see it whenever I shift. Still, 5 seconds might also work. Only more time on the system will tell. Conjecture time. Stay with me. Now I have all I need to estimate battery life in various configurations. I’ll use 75% of the rated battery capacity to account for inefficiencies and my desire to recharge once the battery gauge reaches one bar instead of complete discharge, to provide some buffer. So C = 375 instead of 500. With these assumptions I’d expect to get 375 / 155 = 25 hours of moving time between full charge and one bar, if I could turn the display completely off. That represents 5 days of my style of touring with a roughly 20% buffer. Not great but it does meet my initial requirement that I consistently get a full work week of touring between charges. Even with 5 seconds of display time each shift I think I could make this work. Now for a really pessimistic view. Let’s say that instead of 25 hours moving in my always-on configuration, I never see better than the 17 hours I’ve already seen. That puts Ishift at 500 / 17 – 5 = 24mA. I’d be getting around 375 / 24 = 16 hours before the battery gauge gets to one bar (with still maybe 20% capacity left). Ouch. If this is the best I can expect I’ll have some serious reservations about Di2. But I think this number is excessively pessimistic. For example, even my most optimistic calculation of 25 hours of run time (display off) is dramatically lower than the lowest numbers I’ve seen reported about Ultegra Di2 (I haven’t seen any numbers on Alfine Di2). This makes me wonder if I’m not accounting for the difference between the two. After the display, the next obvious difference between Alfine and Ultegra Di2 is the motor and shift mechanism. Up until now I’ve assumed the energy required to shift the Alfine IGH is no more than what’s required to move a chain around an external set of gears with Ultegra. However I don’t have much basis for this assumption and currently have neither an Ultegra derailleur to test nor an instrument capable of testing it. If I’m wrong about this, the Alfine itself could be another reason I’m not getting the fabulous battery life that others report. With my Alfine experience so far I may not need it, but this may be another reason to switch from Alfine to Ultegra. 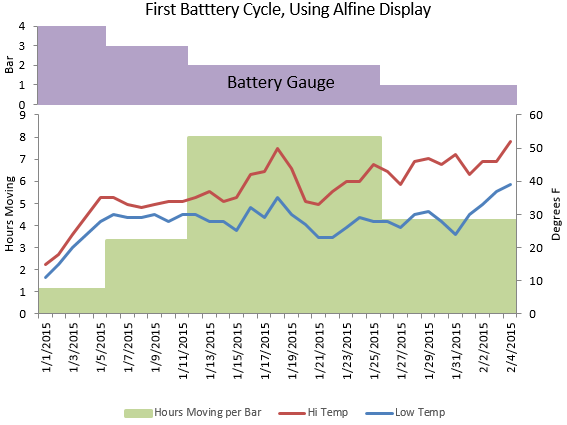 Update: I have now seen a report for Alfine Di2 battery life. Roughly 360 miles in 6 weeks on a charge. The mileage is better than I’ve seen so far. Update 4/25/2016: With 3 charge cycles under my belt in the Ultegra Di2 configuration, I’m averaging 48 hours moving, 100 elapsed days, and 527 miles from full charge to one bar. Now we’re talking. All right, so what can I currently say about battery life with any degree of certainty? Really just two things: 1) the battery life I’ve experienced so far does not meet my minimum requirements, and 2) turning off or eliminating the display should significantly improve battery life. Time will tell, but I think battery life for Alfine Di2 will still work out, though probably at the low end of my acceptable range. Given that reports on Ultegra Di2 battery life are dramatically better than what I’m seeing with Alfine, and in the absence of evidence to the contrary, I’m willing to believe that Ultegra Di2 might be significantly better than Alfine. This would put it well over my minimum requirements. Stay tuned as I compile more data, the most recent found here. This entry was posted in Sprint Di2 and tagged Alfine, Di2, Ultegra on February 16, 2015 by Kurt. Realistically, I will be touring in much warmer average temperatures than you experienced in these winter time tests. And it seems that is where it’s critical. On a tour, charging may be more difficult than at home, where I can charge daily if need be. And, on tour I would think the battery could be easily charged, almost fully, every day with a light weight travel solar panel. If so, charging on tour is no problem. I really like the idea of having the display, maybe just for the cool factor, but I would think it would be particularly useful on tours where it would help finding just the right gear combination for long continuous slopes or flats with consistent wind. As you say, it’s not as critical in town, where you’re rarely in the same gear for more than a few minutes. So, I see little or no limitation in the battery. Topping off the battery daily might be OK in extreme situations but it’s not something I want to rely on. I think it’s pretty likely I’ll get at least a week of touring between charges when temperatures rise and I turn the display off as much as possible. I’m already getting good enough battery life for commuting and recreational riding and it’s true that I can rely on warmer temperatures for touring, but I really don’t know how much that will improve things. I want to see it last a week before I dump more money into this project. I’d gladly give up the display to get my week but I don’t think I’ll have to. 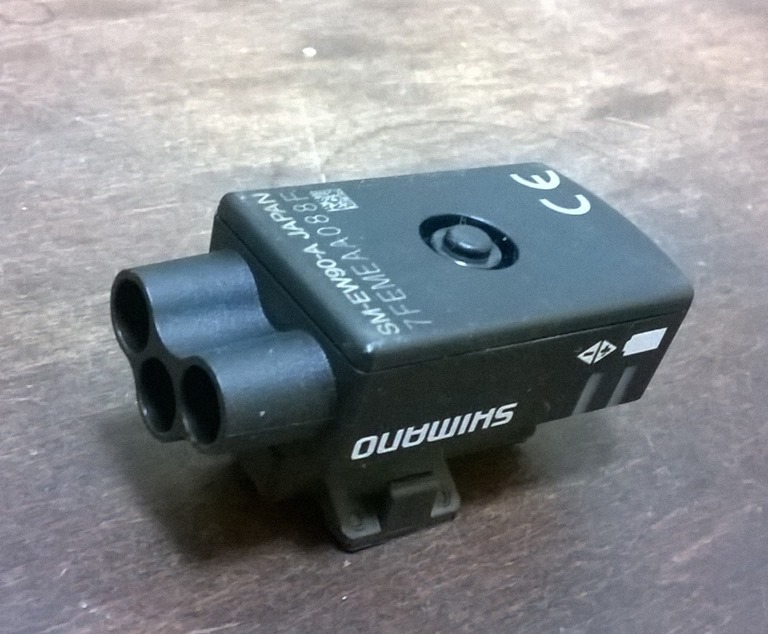 So if you DONT want a display and DONT need a front derailleur, could you use the EW90 A-Junction box to bypass the B-Junction box altogether? That should work fine. The only problem I see is that, because the lead on the shifter is short, the EW90-A junction box has to be located near it. Which means you’ll have two E-Tube wires running from the handlebar– one for the rear derailleur and one for the battery. On the trike configuration I’ve been concerned with that’s a bit of a problem but on other configurations it might be fine. have been attempting to locate the power drain source by simple process of elimination, however to date without success. Are you able to provide more detailed information on how you constructed your ‘handy-dandy breakout cable’. Seems to be the obvious fault detection solution and my local bike shop don’t seem to be able to offer an useful help or advice! Hi Peter. For my breakout cable I just took the shortest Di2 cable on hand and cut one of the two wires in the middle (see article above for more details on cutting the Di2 wire). I put some heat shrink around it to give it some strength, and I tinned the resulting two bare wires (added solder to the wire strands so they wouldn’t fray). With this you can plug the breakout between the components you want to test, and use a DVM (in ammeter mode) to complete the circuit between the two bare wires (that used to be connected). Depending on what you’re connecting between, you might need an extra junction box (SM-JC41 Junction B) and another section of Di2 cable to act as a gender changer. With this setup you should be able to measure current draw (in milliamps) between various components of the system and isolate the offending component. I’m guessing you’ll need all of the components plugged in and operating to get a good result. By operating I don’t necessarily mean shifting– getting an accurate measurement of current draw while shifting isn’t really possible with this setup. But if a component is using too much current, It’s likely happening between shifts when current is steady. If so you should be able to detect it. You can use some of the numbers in this article to compare against. Keep in mind most of my measurements were with the Alfine display, not the cockpit junction box that I’m guessing you’re using. FWIW I’ve got over a year on my Ultegra Di2 (with Alfine display) setup and am currently averaging about 3 months and 600 miles between charges. Let me know how it goes, I’d love some advanced warning on failures that might be in my future. I didn’t use a setup like this to test components when my first battery failed, and since my new battery has worked fine now for over six months, it’s pretty clear that the battery was the problem. I would definitely do the component testing in Peter’s case, but keep in mind it still could be the battery that’s failing. Yes, I’m not sure which sounds worse, two bad batteries or a different bad component. If it turns out to be a non-battery component, my money is on a derailleur. But that is purely speculation. It’s also worth noting that the battery isn’t just a battery– it also has a microcontroller in it. So the battery could be failing because the cells are bad or because the circuitry around them is bad. The bad circuitry theory seems like a stretch to me. My money is on or some sort of mechanical binding in either derailleur that is causing the servo to continue adjusting after the gear has changed, preventing it from going into sleep mode. It should be easy to detect a component that isn’t going into sleep mode with the breakout cable. Again, all of this is speculation on my part, I haven’t experienced it. Now for the obvious: before doing any diagnostics, make sure you can talk to each component in the system with the Shimano software, and that each component is at the latest firmware revision. One more thing: Between the three of us we’ve been speculating a lot about the health/capacity of the battery. This is a measureable thing, involving running a fully-charged battery down using a controlled load. Might be time to make that device. Or find a battery conditioner that would work with the e-tube battery. The hitch is whether the electronics would get in the way, that piece is a bit of a mystery to me. Maybe Shimano already has a way to do this, but I’ve never seen mention of it. Ignoring these 60 second spikes we isolated the 0.75mA parasitic current to the junction box that has the LED and adjustment button. I had this unit fail on my bike about 12 months back, when I opened it there was a small piece of plastic left from the extruding process preventing the neoprene seal from seating properly allowing water inside. I sent the unit off to Shimano for comment, but they ‘lost’ it and told me I had invalidated the warranty anyway by prising it open. Its a simple snap lid like any cheap watch back and the plastic flashing looked like a manufacturing fault to me. Makes me wonder now that we seem to have another faulty junction unit. Yes, I wonder if that 25mA pulse is servicing a watchdog timer. Seems awfully big for that. I didn’t notice it when I was doing my testing but easily could have missed it. Or maybe this is a difference between the Alfine display/junction I’m using and the -A junction box (unlikely). Makes me want to get my hands on a ‘scope to see what’s really going on. .75mA of idle current is big but by itself doesn’t account for the battery draining in several days. Maybe that and the combination of the mysterious pulse? Still seems like we’re missing something, but clearly your friend’s junction box is odd man out, so likely the source of her problems. How much time does she have on it? Let us know if swapping it solves her problem! Your experience with Shimano service/customer support is disappointing but not far from my own. Difficult to get any real information out of them and their decisions seem arbitrary. Kurt, you are right the numbers do not make sense. I had a bit of a think about it and checked my bike again this morning with a more accurate measuring setup. The current settles to 0.07mA after connecting the battery and waiting for the battery green light to go out on the junction connector. There is an 8.5mA pulse that lasts approx 20mSecs every 59.5 seconds. On my friends Di2 the current pulse was there but the current was much higher than the 0.07mA I am seeing on my bike, maybe I was out by a factor of 10 and it was 7.5mA which would discharge the battery in 60 hours which is more in line with what’s happening. She lives some distance away so a retest will have to wait. Kevin, I don’t know which makes you more of a geek– knowing what an oscilloscope is or having one available to wheel out:). But now we know a lot more about what’s going on. Strange that the 60-sec pulse stops after 20 minutes. Initially I thought that blew the watchdog/heartbeat theory, but maybe not. Maybe that’s intended for recovery only while riding and it’s turned off after it goes into a deeper power-save mode. Who knows. In any case, sounds like you have a plausible explanation for your friend’s short battery life. Let us know how it turns out! I enjoyed your excellent analyses of the vast, murky depths of Di2 electronics. Really, I did. Guess that puts me in the geek category as well. I don’t think this explains Kevin’s friend’s problem, but I noticed when I was fiddling with my derailleur calibration that it’s pretty easy to leave Di2 in a non-functional, high current drain state. Just bring up the e-tube software and get it connected, then disconnect it without first exiting the program normally. It’s pretty obvious there’s a problem because nothing happens when you try to shift. Meanwhile the e-tube software warns that the system is in a bad state that may drain the battery rapidly (I’m paraphrasing from memory here). The fix is to plug the system back in, bring up the software, connect, and then exit normally. I learned this lesson when I knocked my computer onto the floor, disconnecting everything. The computer still works! Mark, that’s awesome, and tracks pretty closely to what I’m seeing. With three charge cycles in my Ultegra configuration I’m averaging 100 days and 527 miles from full charge to 1 bar. I’m guessing you’ll see increased mileage on a charge as you ride more in the warm weather. I am posting a follow up fix report on Di2 battery life on my friends bike. (see my earlier posts) Well I finally persuaded my friend to buy a new junction A box (actually a new to her but second hand unit on the local version of eBay here in NZ called TradeMe) Once fitted she was very happy to find the flat battery problem solved! She carried around a spare charged battery for a few weeks until her confidence in the fix was established. So that’s my second experience with faulty junction A boxes. What’s the story Shimano? I have asked if she will give me the old junction A box to investigate further but she has either forgotten or is unwilling for some reason. So if you are experiencing Di2 batteries going flat inside a week suspect the junction A box and also check the 4 way junction connector for low resistance. Good to know that the junction boxes can be a problem. Note we’re using the Alfine SC-705 display in place of a junction A or B. Guessing it is just as likely to have the same problem but we haven’t experienced it. Glad your friend’s Di2 is working again!